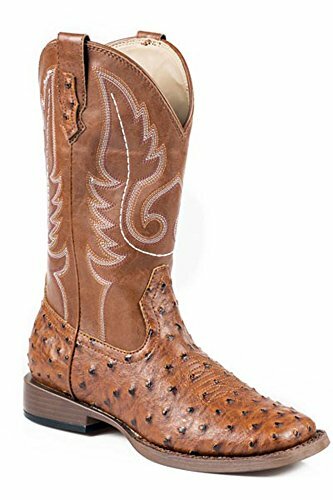 Looking for Men's Vegan Cowboy Boots that look like the real thing? You're in the right place! These Roper cowboy boots feature contrast stitching and crinkled vegan leather for an authentic look. Advertised as vegan: No, but all parts are detailed as faux leather and synthetic material. Pros: Flexible with a comfortable cushioned footbed. Cons: Somewhat pricey and said to run small. Classic embroidered cowboy boots in deep brown. Advertised as vegan: Not as vegan but as faux leather. Pros: The J-Flex Flexible Comfort System is meant to provide maximum shock absorption. Cons: On the pricey side. Embroidered upper and flashy faux snakeskin lower. Advertised as vegan: No, but they're said to be made from man-made/synthetic materials. Pros: Cushioned insole and generally reported to fit well. 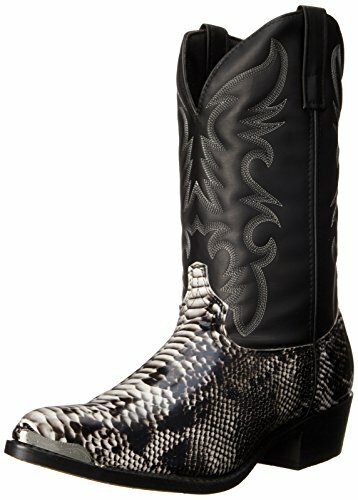 Cons: Some reviewers have felt that the faux snakeskin is somewhat shiny and "fake" looking, so if you're looking for an exact animal skin replica, these might not be your style. 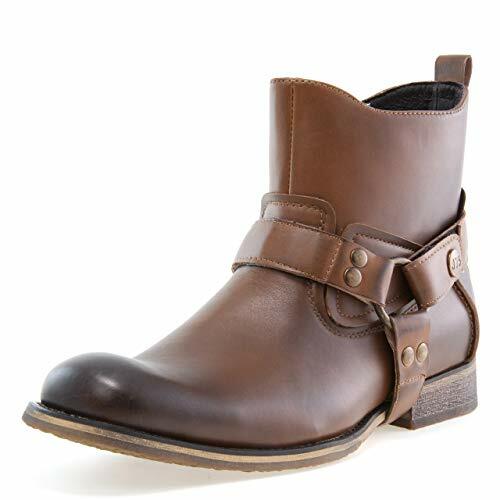 The burnished look on the toe and heel give these removable harness boots a rustic, worn-in aesthetic. Advertised as vegan: No, but they're described as synthetic. Pros: True to size and made with a no-skid outsole. Cons: According to some reviewers, they may need to be worn less often to stay in good shape. 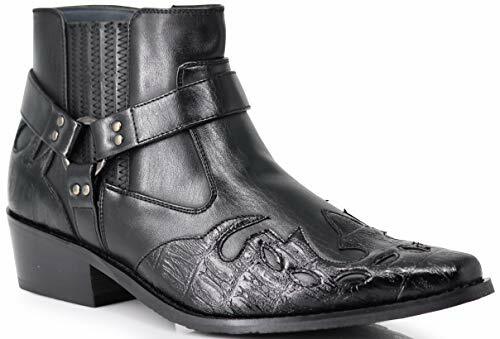 This dressy mid-length boot features a belt buckle and chain harness, a textured faux crocodile foot and pointed toe. Advertised as vegan: No. The description says faux crocodile and synthetic materials. Pros: Very reasonably priced. Plus, the faux crocodile is very convincing. Cons: They might be difficult to get into if your foot isn't narrow. 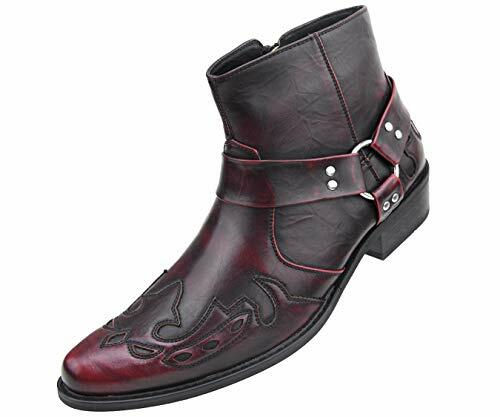 These burgundy gradient, cut-out wing tip design boots are said to be made for line dancing. Advertised as vegan: No, but they're all synthetic. Pros: The zipper should make them easy to get in and out of. Cons: No cons that we could detect. 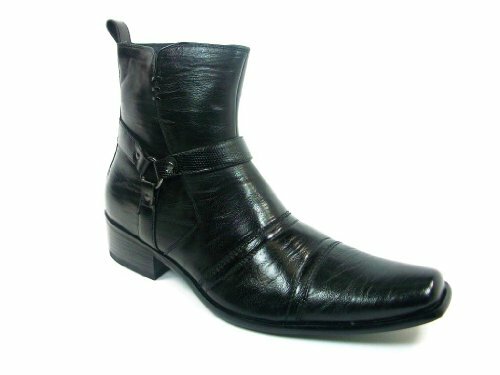 An ankle-height western-style boot with a low stacked heel and long toe that comes to an elegant point, suited to business and fancy occasions. Advertised as vegan: No. They're advertised as faux leather with a mix of textile and "other materials," but as Asos states "real leather" anywhere genuine leather is used, we assume the "other materials" are non-leather. Pros: Elastic backing should make them easy to slip on. Cons: No cons (or reviews) that we could find. Solid leatherette motorcycle boots with a long, squared-off toe and harness straps. Advertised as vegan: No. The product description says "leatherette," which is an animal-free, synthetic material made to look like leather. 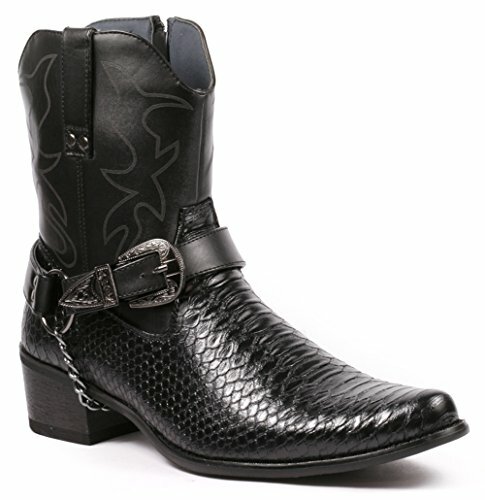 The ornate contrast stitching on the calf nicely complements the imitation ostrich pattern on the foot. Advertised as vegan: Not per se, but the Amazon vendor verifies that they are "completely man-made." Cons: Some users indicate that they may not be built for rougher wear. The embellished toe and heel on these boots looks a lot like faux alligator, whether it's meant to be or not. Advertised as vegan: They're not advertised as vegan, but they're marked as synthetic. Pros: Padded insole and very fair pricing. Cons: No cons that we're aware of.